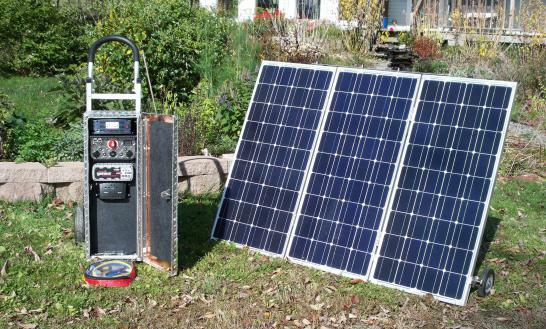 The 2500 Series, our fourth-largest fully-portable, EMP protected, solar backup power systems. Pictured with optional 200 watt solar panel assembly. 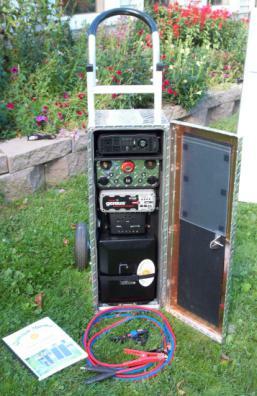 This 2500 watt modified sine-wave model is a truly effective home emergency backup power source. It will reliably power anything within it's capability, including full-size refrigerators and freezers, table saws and chop saws, as well as any hand-held tools, such as drills, grinders and circular saws, etc. It will also, of course, power smaller items such as TVs, cell phones, laptops, tablets, etc. It's modified sine-wave may have difficulty with some items, such as microwaves, inductive heat plates and some laser printers. Featuring a heavy-duty, 30 Amp charge controller, the Model 2500 allows for easy solar array upgrades in the future. It will handle up to 4, 100 watt panels under most conditions. Both the base unit and any solar panel assemblies are mounted on wheels, which provide the ultimate in portability and ease of use. The entire system can be set up in 30 seconds or less! The sturdy construction of aluminum, copper, and stainless steel will provide for many years of demanding service with a minimum of maintenance. Modular construction, and clear instructions allow the owner to easily remove any malfunctioning component and return it to us for repair without having to box up and ship the entire unit. The finest warranty in the industry means you will NEVER have to pay any labor costs for ANY repairs, as long as you own the unit. 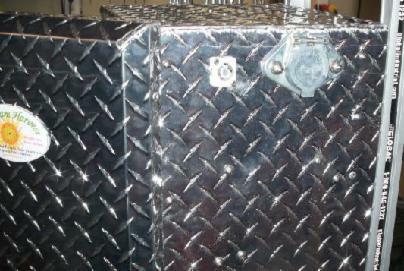 This machine contains a battery bank of six, 35 amp/hour batteries, for a total capacity of 210 amp/hrs. How much real power is that? If we multiply the 210 amp/hours by the nominal voltage (12 volts), we get a capacity of 2,520 watt/hours (watts = volts times amps). This machine will also run a full-sized refrigerator or freezer for several days, even without the solar panels hooked up. In my own load and endurance tests, which are still ongoing, some real-world numbers I have seen so far for the 2500 watt model are detailed below. The first 3 tests were run without the solar panels plugged in, nor was the AC charger plugged in. These were endurance tests, and as such, were run until the batteries were exhausted. Test 1: 10 cubic foot chest freezer, in the house, ambient temperature was between 72 to 83 degrees F, ran for 53 hours. Test 3: This was an operational test. The unit was set up to power carpentry tools, including a 10” table saw, a 10” sliding cross-cut saw, and a 7” circular saw. It also had a cordless drill battery charger plugged in, and charged both batteries. The power station's batteries were at indicated 50% charge when test was started. The 200 watt solar panel assembly was deployed with good sun exposure. The tools were run as needed for a minor home remodeling project that took approximately 6 hours. By dusk, having had 10 hours of full sunlight, even running the tools, the station's batteries were indicating full charge. 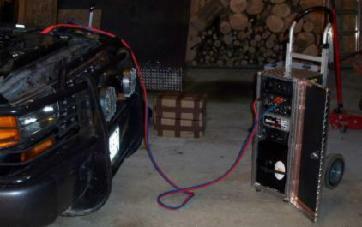 Inverter: Cobra 2500 watt Modified Sine Wave; 5000 watt surge. 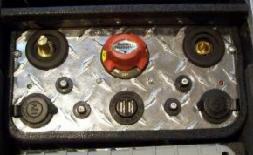 Battery Bank: 6- ML35-12 AGM Deep-cycle batteries, 35 Amp/hours each. Solar Charger/Controller: Instapark PRS-3030 PWM 30 Amp Solar Power Charge Controller. Paypal, we now offer a Lay-away option. Purchase optional solar panel assemblies here. *Due to the combined weight being over 240 lbs, this machine will ship in multiple cartons by UPS Ground. The base generator is in one carton, the completely assembled solar panel assembly, (if one is ordered) in another, and the batteries in another. The only assembly required is to place the wheels on the axles, bolt on the handle, and place the batteries in the generator base unit. Each battery weighs only 23 lbs, and simply plugs into a connector. Total assembly time for most people is about 1/2 hour. The only tools required are a 1/4" allen wrench, a 1/2" wrench, and a pair of pliers (or 9/16" wrench) to install the main fuse. Email us at: sales@quantumharvest.net for additional shipping options or other information. Identical to the Model 2500, except for the inverter. The Model 2505 features a commercial-duty Samlex America 2000 watt continuous, 4000 watt surge, true sine-wave inverter with their proven soft-start technology. Pictured with optional 300 watt solar panel assembly. *Includes shipping anywhere in the Continental US, and $50 Rebate for purchase of solar panel assembly with a base unit. Almost identical to the proven Model 2505 TSW, this model also uses the excellent Samlex 2000 watt True Sine-wave inverter. The difference is that the Model 2505-60 TSW has a heavy-duty 60 amp solar charge controller, as well as an upgraded solar panel connector rated for heavy 60 amp current from a large solar panel array. This model will handle arrays up to 720 watts. 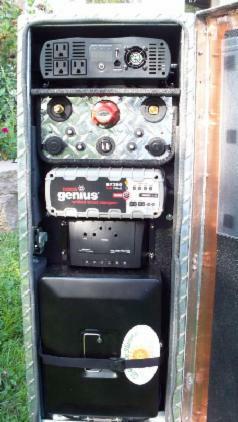 It also uses 2, 70 amp resettable circuit breakers to protect both the battery bank and the solar charge controller from excessive current. This model is most often combined with an additional external battery bank. *Due to the combined weight being over 240 lbs, this machine will ship in multiple cartons by UPS Ground. 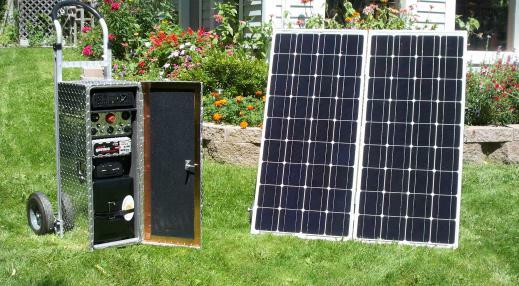 The base generator is in one carton, the completely assembled solar panel assembly, (if one is ordered) in another, and the batteries in another. The only assembly required is to place the wheels on the axles, bolt on the handle, and place the batteries in the generator base unit. Each battery weighs only 23 lbs, and simply plugs into a connector. Total assembly time for most people is about 1/2 hour. The only tools required are a 1/4" allen wrench ,a 1/2" wrench, and a pair of pliers (or 9/16" wrench) to install the main fuse. Replacement Genius 7200 AC Charger. Fits all 1500, 2500, and 2550 Series Generators, pre-wired. Model 2505-60 TSW Custom Package.